Click for flyer. Please note: the correct date for this event is Saturday, July 16th. 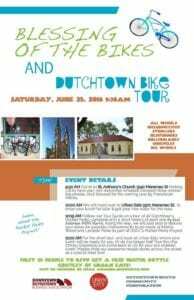 Join the Dutchtown South Community Corporation, Downtown Dutchtown Business Association, and Urban Eats for a Blessing of the Bikes and Dutchtown Pocket Park Tour on Saturday, July 16th. The event begins at 9:30 at St. Anthony of Padua. Participants will be able to have their bicycles, scooters, strollers, and other non-motorized transportation blessed by Franciscan Monks. 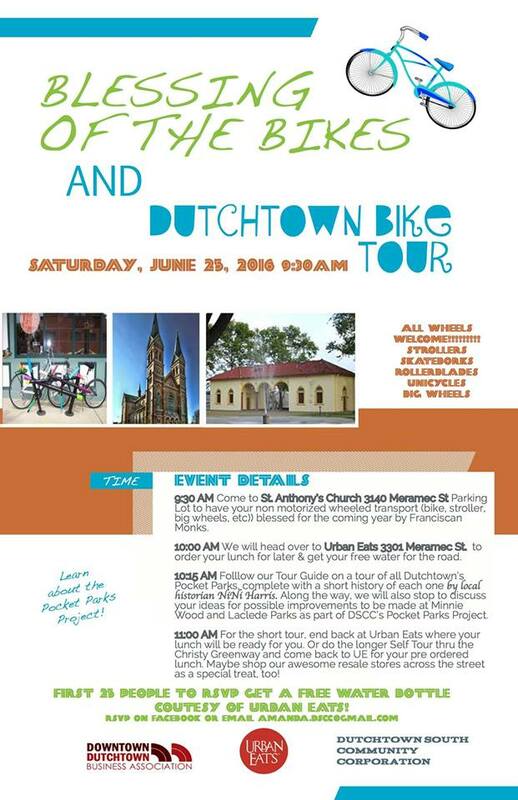 At 10:00, meet at Urban Eats and follow your tour guide through Dutchtown’s pocket parks. There will also be opportunity to discuss possible improvements to Minnie Wood and Laclede Parks. Finally, head back to Urban Eats for lunch, or continue on a self-guided tour of the Christy Greenway. To RSVP, please visit the Facebook event page or email amanda.dscc@gmail.com.